Future Mercedes vehicles will adopt this radical redesign: "The days of creases are over." We’re used to seeing teasers in the form of cars disguised in camouflage or hiding under covers to keep the styling cues a secret. Mercedes has taken this a stage further by showing us a sculpture of a car under a cover. Think of it as a teaser of a teaser. Mercedes calls its work of art the “Aesthetics A” sculpture, which shows off its vision of the design language that future compact Mercedes vehicles will adopt. In essence, this is how the next Mercedes CLA will look. The Aesthetics A represents the most radical redesign for Mercedes since the launch of the current A-Class in 2012, notable for its edges and creases in the sheet metal which inspired the look of every current model in the Mercedes range. Mercedes say this new look builds on its “Sensual Purity” design philosophy. One notable design feature of the Aesthetics A is the return of the striking Panamericana grille with its vertical bars lifted from the AMG GTR. However, the most radical change the new design language brings is the simplified sides, replacing the various lines and creases that defined old designs with one clean line stretched across the entire length of the car. It’s a stark contrast to the side creases on the current CLA. "Form and body are what remain when creases and lines are reduced to the extreme. We have the courage to implement this purism", says Chief Design Officer of Daimler AG, Gorden Wagener. "In combination with perfect proportions and sensual surface design, the upcoming generation of the compact class has the potential to herald a new design era. Design is also the art of omission: the days of creases are over". 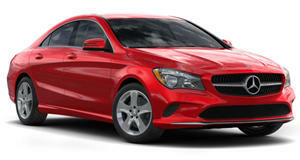 It's hard to give an informed judgment on the sculpture, but what we’ve seen so far looks sleeker than the current CLA. What do you think of this new cleaner look of future Mercedes compacts?